I was not overly optimistic about this when I bought this, so god knows why I bought it. It was definitely a whim. Having bought it I am really glad that I did. I had used one of Rimmel's cheek tints before (here) and liked it - but to be honest I didn't really know how it would differ. Wake Me Up's version is a lot more shimmery, where as this reminds me a lot of BeneTint. It's more of a solid colour with no shimmer. The colour is a gorgeous rosy pink. You really only need a tiny bit of it, a little really goes a long way and it lasts for hours. It's a great little product and I am really enjoying using it. I've been popping this as my blusher with Mac Mineralize Skinfinish in Adored on top and the two work really well together. For a small price tag it is a great, long lasting product that I would highly recommend. The only thing that does gripe me is that I think it's starting to bring me out in spots along my cheek bone. The new Stay Matte foundation has done the same to me as well (review pending) and the other cheek tint from Rimmel did as well. I'm thinking maybe Rimmel face products just really don't agree with my skin. I'm hoping I'm wrong and will of course keep trying, but at the moment it does look that way. Also - happy October!! Where on EARTH did September go?! I don't mind so much as my birthday is in November so I'm getting excited for that, but it just seems this year is zooming by! 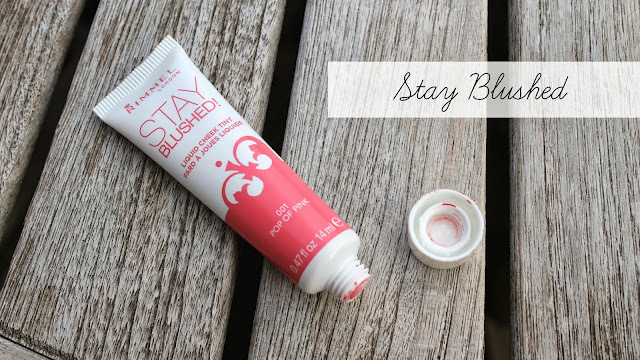 Have you tried Stay Blusher? What cheek tints would you recommend?